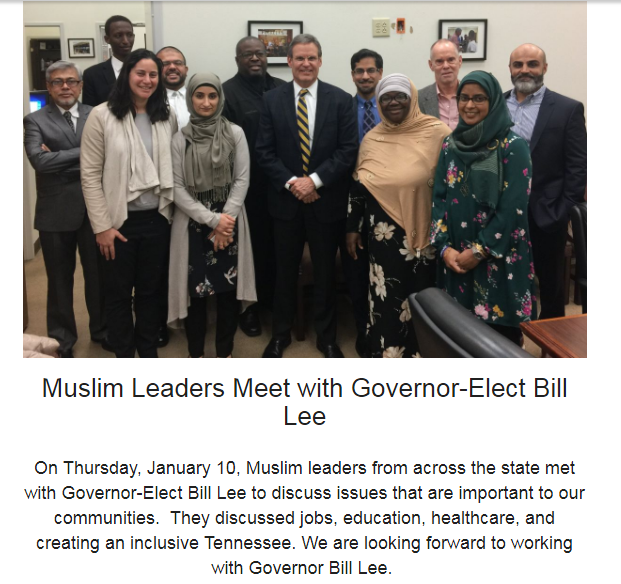 Ten days before his inauguration as Tennessee’s 50th governor, Bill Lee prioritized meeting with the Tennessee American Muslim Advisory Council (AMAC) while denying other requests for meetings with non-Muslim groups. The following day, AMAC posted the photo of Bill Lee embracing members of the organization. Oh, the fundraising possibilities! The photo also includes Samar Ali which is a little strange since she has not been known to publicly affiliate with the AMAC. Perhaps Haslam’s super-short term political appointee was the one who helped arrange the meeting between Lee and AMAC. In addition to Samar’s expertise in sharia finance, she is also a devotee of former president Jimmy Carter, author of the biased book Palestine:Peace Not Apartheid a title which helps prop up the anti-Israel propaganda of the Boycott, Sanctions & Divestment (BDS) campaign against Israel.Carter’s persistence in casting the terrorist PLO’s leader Yasser Arafat in a positive light, tells you all you need to know about Carter’s own anti-Israel biases. Gee, think he forgot that in 1997, the U.S. designated Hamas as a foreign terrorist organization? Regardless, Samar traveled with Carter and his team to witness the Muslim Brotherhood candidate Mohamed Morsi being elected president in Egypt. According to the Vanderbilt Law School website, Samar’s mother immigrated to the U.S. from Syria and her father is from the West Bank town of Ramallah. Both her parents are listed as large dollar donors of the Carter Center. Another interesting note about Samar and her training in sharia finance relates to her position as an intern in Amman, Jordan, for the International Arab Bank during the time that a lawsuit had been filed against the bank alleging that the bank was managing the funding of payments to the families of Palestinian Islamic Jihad (PIJ) martyrs. Add to this that since 2005, Samar’s father Subhi Ali, has led the board of the D.C.-based Jerusalem Fund, an organization devoted to destroying Israel. The founder of Subhi Ali’s Jerusalem Fund, a guy named Hisham Sharabi, was also a board member of the World and Islam Studies Enterprise (WISE) which was funding the PIJ allegedly through the Arab Bank where Samar was interning. Some Lee supporters have defended his meeting with AMAC going so far as to say, “he had to,” while others who have followed AMAC and their member’s activities, expressed concern about the meeting. People are right to be troubled by Lee’s eagerness to connect with the group. For starters, AMAC has fully adopted the radical left’s “intersectionality” ideology and along with it, Islamist Linda Sarsour, one of the country’s leading Jew-haters. “Intersectionality” claims that all self-described oppressed groups are united through their alleged oppression. Linda Sarsour was born in New York to parents who are Palestinian immigrants. She uses her version of intersectionality to try and camouflage her rabid Jew-hatred as humanitarian concern for Palestinians. 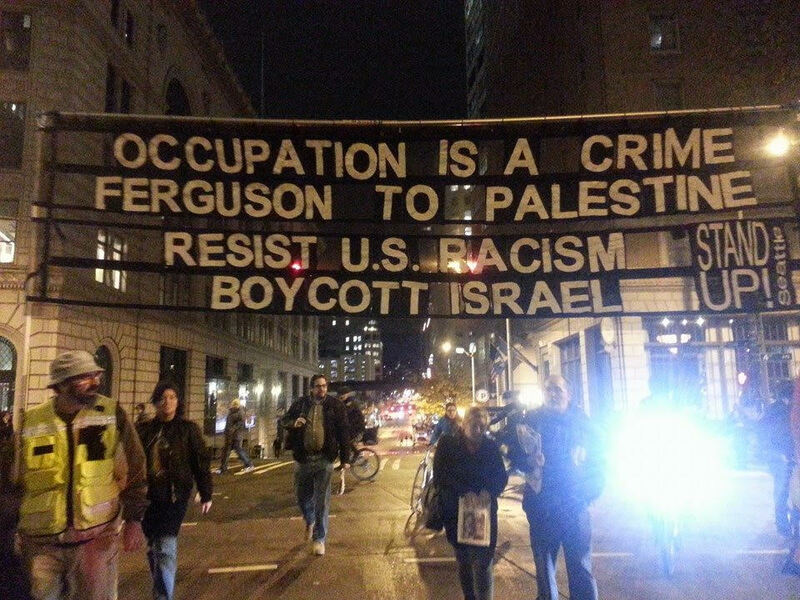 For example, it was Linda Sarsour’s “Muslims for Ferguson” that injected Jew-hatred into the riots that occurred after the fatal shooting of Michael Brown, by reviving the anti-Semitic “Zionism is racism” libel with banners reading: Occupation is a crime Ferguson to Palestine. Resist U.S. racism. Boycott Israel. AMAC board member Drost Kokoye has been equally overt in her Ferguson-incited anti-Semitism. Even before Sarsour co-founded the, 2017 The Women’s March, she was a featured speaker at AMAC’s 2016 event called “Unity at All Intersections.” Speaking alongside Sarsour was AMAC’s resident anti-Semite, Drost Kokoye. They were joined by the Muslim Brotherhood Islamic Society of North America’s (ISNA) fundraiser Faheed Tasleem. Sarsour uses intersectionality to justify pushing the Boycott, Divestment & Sanctions (BDS) attack against Israel in every venue in which she is involved. BDS is fueled by anti-Semitic rhetoric from agitators who openly attack Zionism, the movement that helped exiled Jews return to their ancestral homeland and establish the State of Israel. BDS’ers deceptively embed their purported objectives in language about social justice and human rights, but at the same time, call for a genocide of the Jewish people. Rallying around their mantra “Palestine will be free, from the river to the sea” BDS’ers want no Israel or Jews to exist between the Jordan River and the Mediterranean Ocean. The goal of BDS is simple – it is to end Israel as a Jewish state by any means possible. Like Sarsour, AMAC’s Kokoye uses her Twitter account to attack Zionism. 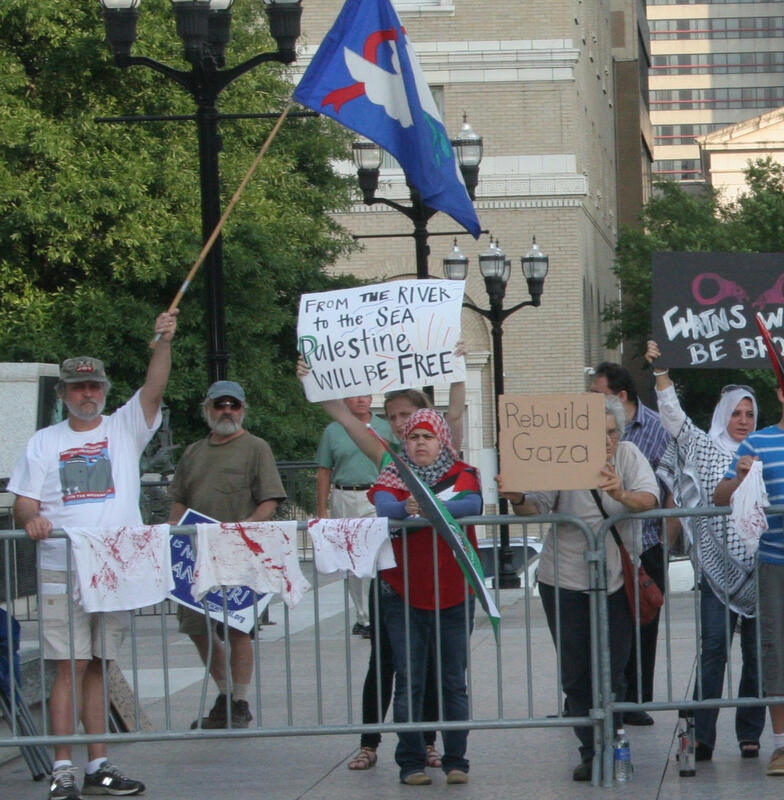 AMAC board members Zulfat Suara, Kasar Abdulla, Mohamed Shukri Hassan, Rashed Fakhruddin, Danish Siddiqui and Sabina Mohyuddin, who were on the ground floor with Kokoye launching their organization and are pictured with Bill Lee, have never disavowed board member Kokoye’s Jew hatred. Nor have AMAC board members ever disavowed Kokoye’s public mocking of gays. 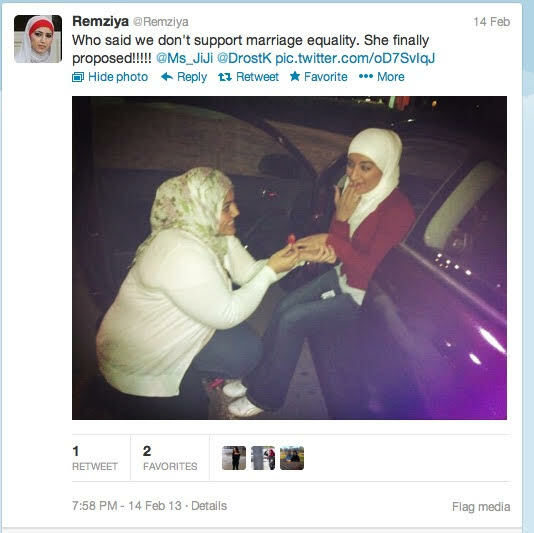 The tweet was posted by Nashville Islamist Remziya Suleyman who organized and ran the American Center for Outreach (ACO) and also helped organize AMAC. At the time of the mocking tweet, AMAC members Mohamed Shukri Hassan, Danish Siddiqui and Kasar Abdulla, were all part of ACO; Shukri was an ACO fellow, Siddiqui was Chairman of the board and Kasar Abdulla, a long-time collaborator and running buddy of Suleyman’s was a board director. Kasar’s sister Jihan in the photo was working as for ACO as director Suleyman’s assistant. Suleyman was a leading force behind the ACO and AMAC organizing. She was also the first one to get CAIR involved in Tennessee. 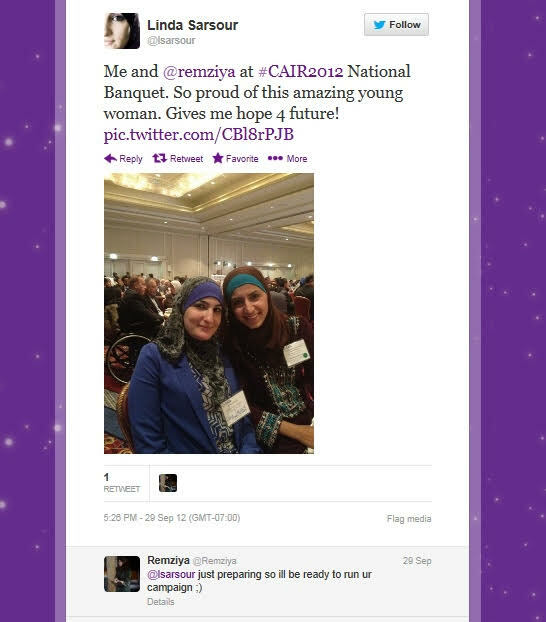 She was also the first one to connect with Linda Sarsour, ironically, at a CAIR event in 2012. And while Suleyman was never explicit in vocalizing her anti-Israelness, she made it a point of surrounding herself with other Islamists who did and continue to do so. Suleyman was also the lead organizer that help set the FALSE and FACTUALLY INACCURATE narrative about the 2011 anti-terrorism material support bill. Suleyman and Bob Smietana at The Tennessean claimed that the bill made following sharia law a felony. 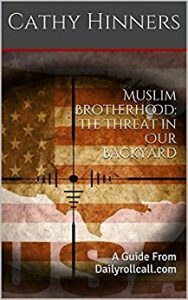 Ironically, the bill defined the term “sharia,” precisely the way jihadist terrorists defined it because this was a bill to prevent terrorist acts by cutting off sources of support. The bill, now a state law, prohibits using religious justification as a defense. This is the very same argument made by those who allege they are peaceful followers of Islam, to wit, that terrorist acts committed by ISIS jihadists or others in the name of their religion, does not represent Islam and that these terrorists are not true followers of the religion. Regardless, AMAC members and their allies continue to peddle what they know is not true. In his inaugural speech, Governor Lee said we should follow the commandment “to love your neighbor as yourself” and “walk in that spirit” of unity. When people criticize Zionists, they mean Jews. You are talking anti-Semitism. Be on the lookout for Part 2 which will tell you more about AMAC’s leader Zulfat Suara. ← Previous Previous post: Dailyrollcall Welcomes A New Author! Excellent article, Pat Hamsa ! Nice work with the documented facts and pictures, and the way you tied the “players” together. Great to have you contributing to Cathy Hinner’s efforts to shine the light on these scoundrels. I have always thought that governors, presidents, secretaries of State, ambassadors & such shoukd always be willing to meet and talk with anyone…as long as appropriate & sufficient security precautions are taken when meeting people known to incite or initiate force &/or fraud. But taking chummy publicity photos is a different matter. Keep in touch with the Investigative Project, Discover the Networks, etc. who track these interconnected malefactors.